This is a variety of four unique tastin' & succulent oysters! We'll ship you a 1/2 dozen of each of our Rome Points, Matunucks, Salt Ponds, & Ninigret Ponds! We also include Captain Tim's Famous Cocktail Sauce, Two Fresh Lemons, an Oyster Knife and our ever popular Mignonette Sauce! This is a great gift idea for the oyster connoisseur in your life! These Are Four Unique Tastin' Oysters! Rome Points, Matunucks, Salt Ponds, and Ninigret Ponds! Everything's Included For An Oysta' Slurpin' Fest! Cocktail Sauce, Mignonette, Schuckin' Knife, & Lemons! Note: Please, Be Careful Opening Your Oysters! We Are Not Responsible If You Cut Yourself! 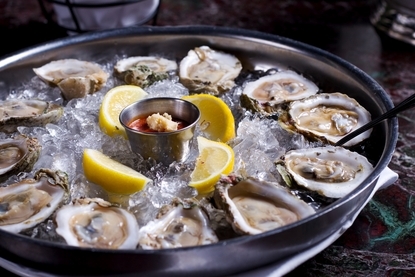 Order Your Oyster Sampler By 10am EST, And Enjoy Them For Dinner Tomorrow! Oysters Also Make A Great Gift Idea For Your Favorite Seafood Lover! How Easy Is That! Oysters were fresh, parents said they were fantastic & can't wait to order again. The hand written thank you was a great touch & will insure that I order again from Lobster Guy. This was my first time ordering from The Lobster Guy but it won't be my last! I live in Tennessee so you know it is difficult and expensive to get high quality seafood. My wife had hinted she would like oysters for our 13th wedding anniversary but the stuff around here is mediocre at best. So I took a chance with TLG. The order was exactly as advertised and delivered on time. Packaging was perfect. Now here is the part you may not believe...we started shucking over a glass of champagne being careful to keep track of which type we were eating. That first oyster blew us both away! It was like getting hit in the head with a cold ocean wave. We tasted them without any sauce or lemon to get the full flavor. They were so good that we ate all of them never having doused any with sauce--just pure oyster goodness. As for the sauces, we definitely enjoyed both and were glad they were in the order but we consumed them by taking a spoonful in between oysters to reset the palate. Oh, and Salt Pond was the unanimous favorite. We will be ordering again! I live in California and my father loves Oysters...we consistently argue over which coast has the best ones. After sending these to him for Fathers Day last year, I knew I had to send them again because he loves them soo much. This year we did the Sampler and he is on cloud 9. Great products. Cheers to the crew for their hard word and great finds!! These were the best oysters Ive ever eaten. Ive ordered 3 more times since. Have ordered ECOS several times, I love Oysters and buy them locally on occasion, It's hit and miss. With the Lobster guy Oysters I have never had a miss. Every time I have received fresh delicious oysters. Well done! To Capt. Tim, Christie and the rest of the crew - THANK YOU so much for the excellent seafood and service we received on a recent order! I had been looking for a good source of east coast seafood, especially oysters and mussels at a reasonable price and just happened on your website by chance. I placed a small sample order to test some of the products - just in case, as has happened before, the supplier couldn't deliver what he promised. No worries there. TheLobsterGuy.com knocked it out of the park! My brother and I are big fans of fresh oysters so I ordered some along with fresh mussels and a few of your frozen items. They arrived in great condition, exactly when promised, with good instructions and cooking tips plus a nice Thank You card signed by Christie - nice touch! I surprised my brother with them later that day and I thought I was going to have to fend off an awkward man-hug - he was totally blown away. We sampled them right then and there and agreed they were super fresh and excellent. We cooked the mussels later (2 qts) with ZERO no-goes! Every one was good to cook and every one opened in the pot - that's pretty amazing! Everything was delicious and we will definitely be ordering from you again! We live about as far from either ocean as you can here in North Dakota but for us - TheLobsterGuy.com is our new connection to the freshest seafood in the US! I already told my wife who was looking for Xmas gift ideas from me THAT'S a gift I'd really love to get! Really Good Oysters! Loved them all, came packed nicely too! We loved all the different oysters! What a treat!! Great way to try all the different types of oysters yall carry! The whole family enjoyed! Even had some first timers turn into oyster lovers! Great Products! We loved the minunette sauce you sent along! I'll be ordering more for the holidays!